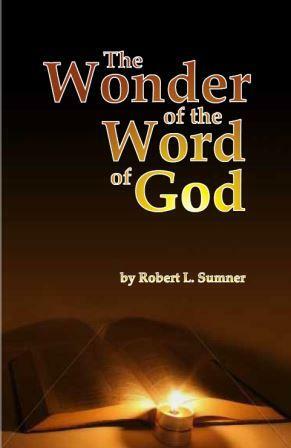 DR. ROBERT L. SUMNER - "THE BIBLICAL EVANGELIST"
THE ONLY PLACE YOU CAN PURCHASE DR. SUMNER'S BOOKS IS ON THIS WEBSITE. PHONE DR. HYMERS AT (818)352-0452 TO ORDER THESE BOOKS. 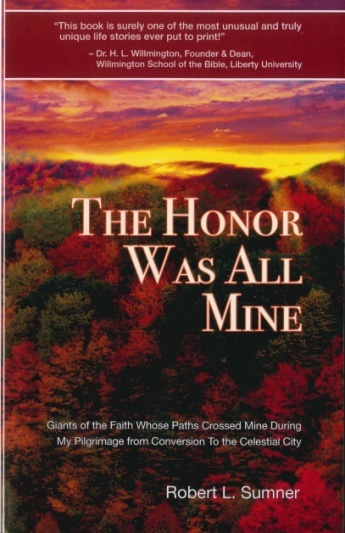 The author has described this book as “Giants of the Faith Whose Paths Crossed Mine During My Pilgrimage from Conversion to the Celestial City.” He has herein 140 such mini-biographies, plus his conversion story. His point in the title is that it was no honor for them to meet him, but that the honor was entirely his. Some of the finest names in 20th century evangelicalism are honored here by the author. SAVED BY GRACE…FOR SERVICE, A sermonic commentary on the Epistle of Ephesians, 333 pages, hardbound. Bible messages from the heart and mind of a dynamic evangelist. Interesting, novel titles such as “Dead Men Tell Tales,” “Sin’s Slaughterhouse,” and “The Greatest, Gravest Questions You Will Ever Answer.” Dr. Bob Ketcham, a founder of the GARBC, called them “captivating” and said, “Every sentence carries weight. There are no wasted words. …They hold the reader’s interest so intensely that it is difficult to lay the book down until the last word is read. ”The Bookstore Journal evaluated this book: “Sermons, many of which have been contest winners, all written with neither waste of time nor words and possessing a white-hot enthusiasm concerning matters of time and eternity. A strange theory arose in the past half-century, attributing divine inspiration to a translation, the King James Version. This is a sane, sensible study of this controversy and shows by many examples what the historic evangelical position has always been. 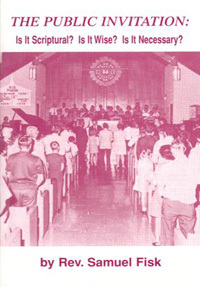 Moody Monthly described this manual on soul winning as “convincing and conviction, compassionate and compelling.” Dr. Lee Roberson, pastor of the historic Highland Park Baptist Church in Chattanooga for over 40 years and founder of Tennessee Temple University and Tennessee Temple Theological Seminary, who gave it his “full commendation,” enthused in the Introduction: “In a day of weak convictions, lukewarm compassion, and almost negative consecration, it is refreshing to read a book that says something!” This book will have its place in the pastor’s study, in the layman’s home, in the classroom. This 22-page booklet consists of a Bible sermon based on Malachi 3:8-10, dealing with the principle of stewardship. It uses many Scriptures and carefully answers the non-tither’s objections. A 24-page factually study using many gripping illustrations, along with many Scriptures, to show how the curse of God is upon those who make, sell, serve, or drink alcohol. Very convincing. Do you know the biblical answer to this question? This 28-page booklet is in two parts. The first is a word-for-word text of a radio message preached by the author on a Texas radio station. The second part, because he was challenged to debate the matter by a minister holding to baptismal regeneration, contains a biblical analysis of every Scripture the latter used. Includes a diagram of Acts 2:38 his opponent could not answer. Very helpful, very Biblical. The Baptist Bulletin said: "Christians would do well to master the contents of this booklet to be prepared in the event that they encounter baptismal regenerationists." 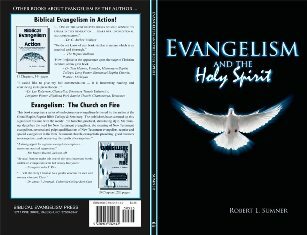 EVANGELISM: THE CHURCH ON FIRE! THE FALSITIES OF ADVENTISM (Sumner) This 28-page booklet shows the Seventh-day Adventist cult to be based on a false foundation; offering a false explanation for that foundation; claiming a false inspiration for its #1 prophetess, Ellen G. White; painting a false picture of prophecy; and offering a false view of law. The author has been an editor for more than 60 years, over a half-century as editor of the paper he started in 1964, The Biblical Evangelist. 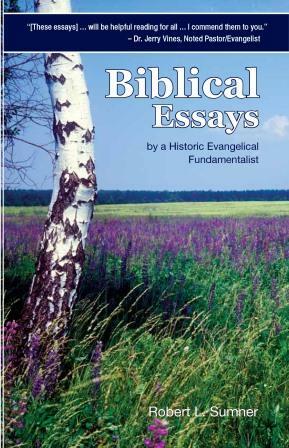 Dr. Sumner has selected 215 of his editorials for this volume, mostly from his paper, but a couple he wrote for Dr. Jerry Falwell’s Fundamentalist Journal and Dr. John R. Rice’s The Sword of the Lord. Altogether there are 302 pages. 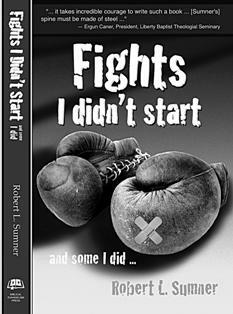 In his Foreword for the book, Dr. O. S. Hawkins, president and CEO of GuideStone Financial Resources and former pastor of two mega churches, wrote: “Robert L. Sumner … has done us all … a great and God honoring service in compiling these scores of editorials into this single volume.” There are 304 pages, including 13 pages for the reader to start his own personal honor roll, recording how those individuals have influenced his or her life for Christ, giving details of how they have helped. Dr. John R. Rawlings, one of the founding patriarchs of the Baptist Bible Fellowship, International: "Through more than half a century, [Sumner] has stood for truth, honesty, and integrity, even when it was not the popular thing ... He is admired and trusted by people throughout the nation for his fairness in dealing with religious controversies ... Dr. Sumner and I started out in two different religious movements; nevertheless, I admire him for his leadership and for setting a scriptural standard for all of us who are Baptists. 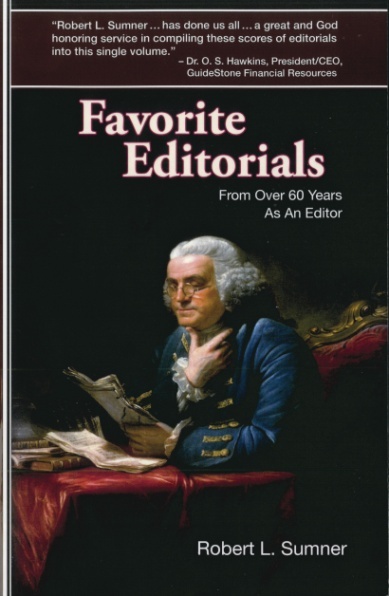 His books and editorials help us to see that there is a correct way, a biblical way to do God's work." FUNDAMENTALIST FOIBLES! (Sumner) In this 26-page study, the author argues that the rules about separation as held by Fundamentalists were changed in the middle of the game. 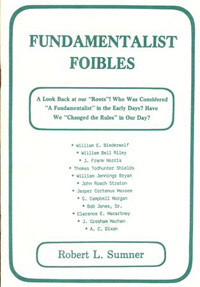 He offers a look back at the movement’s “roots,” showing that many of the founders would not be accepted today in some Fundamentalist churches, offering such giants as W. E. Biederwolf, W. B. Riley, J. Frank Norris, J. Gresham Machen, G. Campbell Morgan and Bob Jones, Sr., as proof. He concludes by showing that separation was not an issue in the early days, and that the secondary separation held by some today would have been totally rejected. Dr. Sumner’s book, based on the 10 gates listed in Nehemiah 3. A volume of 12 chapters, 191 pages, it starts with the gate of salvation and goes through the gate of judgment and into eternity. Would make an excellent text for a new convert or a new membership class, S.S. or Youth meetings. Introduction by Dr. Tim LaHaye, co-author of the Left Behind series. Others highly commending it include Dr. Paul Dixon, Chancellor of Cedarville University; Dr. O. S. Hawkins, President and CEO of Guidestone Financial Resources; and Dr. F. Kenneth Beshore, President of the World Bible Society. Paperbound, our price is 12.00, postpaid. Are you interested in obtaining a verse-by-verse commentary on the Book of Hebrews and can’t decide whether to purchase an expository volume or an evangelistic one? Why not get both in the same book? Here in 37 evangelistic/expository sections, outlined in easy-to-follow sermonic form, is the entire Book of Hebrews. Nothing is left out. Are you tired of going to a commentary for help only to discover the writer “skipped” the tough parts? We absolutely guarantee such won’t happen to you in this book! In short, here is your answer, a Bible commentary with an evangelistic flavor that doesn’t duck any of the major issues, with solid documentation (footnotes on the same page).37 Big Chapters and 546 Informative Pages! Originally, $25. Price reduced to $18, postpaid. IS ARMSTRONG’S CULT NOW ORTHODOX? 22 pages A few years back the current leaders of the Worldwide Church of God (the Armstrong group) announced what it called doctrinal changes and claimed to now be orthodox. 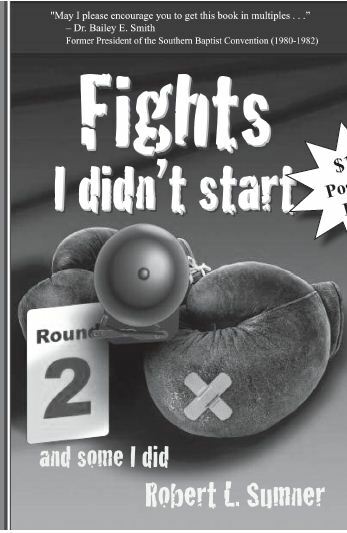 This 22-page booklet examines those claims and the author offers sound reasons was they are false. In addition to this booklet offered at this price, a copy is sent free with every order of the big, hardbound book, Armstrongism, listed above. Dr. Paige Patterson, President, Southwestern Baptist Theological Seminary, former President Southern Baptist Convention: "Sumner views the Epistle not only as the inspired, inerrant, and infallible word of God but as an Epistle, the cogency of which is perfectly suited for the post modern era ... rich with understanding, replete with insight, and ripe with learning. It is a veritable thesaurus of illustrations on salient truths ... he has clearly done his homework here and has penned a commentary that will be profitable even to the scholar in his tower ... This commentary will encourage your soul, challenge your mind, lighten your heart, and increase your commitment to Christ." Dr. Woodrow Kroll, President, Back to the Bible International: "Some Bible commentaries are heavy on scholarship. Others ... are light on everything but application. 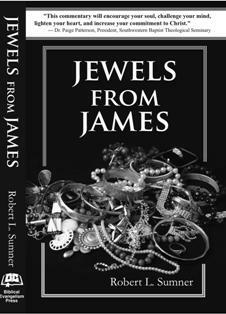 What makes Jewels From James so refreshing is balance ... Sumner brings his wealth of experience and understanding to bear on one of the most neglected epistles in the New Testament ... a book filled with biblical insight balanced with practical guidance in how to put feet to your faith." 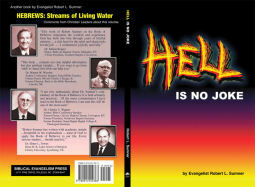 Written by a concerned layman, this 48-page book highlights some of the problems he sees in today’s religious circles. THE PUBLIC INVITATION (Fisk) 26 pgs. Is It Scriptural? Is It Wise? Is It Necessary? Written by a former missionary to the Philippines and long a college professor, this is a scholarly answer to hyper-Calvinism’s objection to the custom of evangelicals in giving public invitations for the lost to trust Christ. The latest printing of this valuable study has a Foreword by Dr. Daniel E. Gelatt, long a successful pastor and representative of a major missionary organization. AFTER THE REVIVAL - WHAT? "Simple Requirements for Spiritual Success," "Scars for the Savior," and "Are Our Standards Too High Today?" A huge 424-page, hardbound book on this major cult. The late Dr. John R. Rice, founder and editor of The Sword of the Lord, said: "We recommend this scholarly and import big book. It is true to the Scriptures, and it will be a tremendous revelation to honest readers." Dr. G. Archer Weniger called it "...the largest, the most informative and the most comprehensive book on the American-based cult."